Design a product, service or solution that demonstrates the value and differentiation of AI in learning. Your creation should demonstrate the best qualities of a symbiotic human-computer experience that takes into consideration the environment, objects, and people. Terra is an Augmented Reality platform that empowers users to build and maintain their own financial landscape while providing guidance and support via artificial intelligence. How might we support millennials in visualizing long-term horizons and achieving financial goals? For a full account of our process, check out our blog here. What are the most salient subjects for people to learn now and in the next 5 years? What opportunities might AI afford in the learning process, and what are its limitations? This line of inquiry led us to consider economic conditions as a whole. After further discussion, we decided to focus on financial wellness as it affects every aspect of an individual s’ life and plays a larger role in the health of the greater economy. With further investigation, we narrowed our target audience to millennials as we found that they are at high financial risk due to a lack of financial literacy. To deepen our understanding in the field of financial literacy, we conducted literature reviews, surveys, and expert interviews. The financial landscape has changed. Millennials now face more complex challenges, such as a massively higher student debt, than the previous generations. Digital payment methods abstract and disconnect people from their money, skewing their mental representation. People are hard-wired to think in and prioritize the short term rather than focusing on far horizons. Making content relevant to the individual is critical. Start with basic concepts before working up to more advanced ones. We used various design methods to help us better understand millennials’ perceptions for their finance, their level of understanding for financial systems and their needs. By using methods like modeling and collage, we were able to help users externalize their abstract concepts. 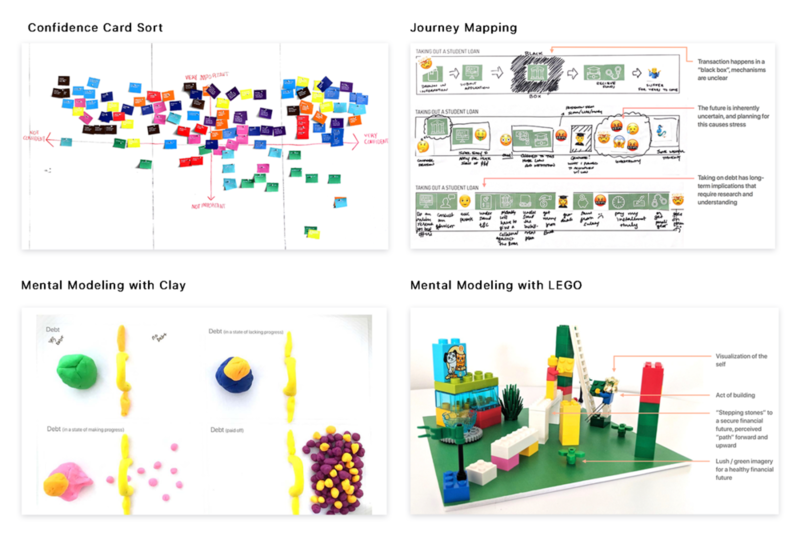 Drawing from our research findings, we brainstormed a variety of concepts centered around three themes: ambient visualization, point of sale information and future casting. As we speed dated and tested the ideas with users, we were able to narrow down to one concept and start iterating. Terra supports two primary channels for interaction: one in the home and one out in the world. 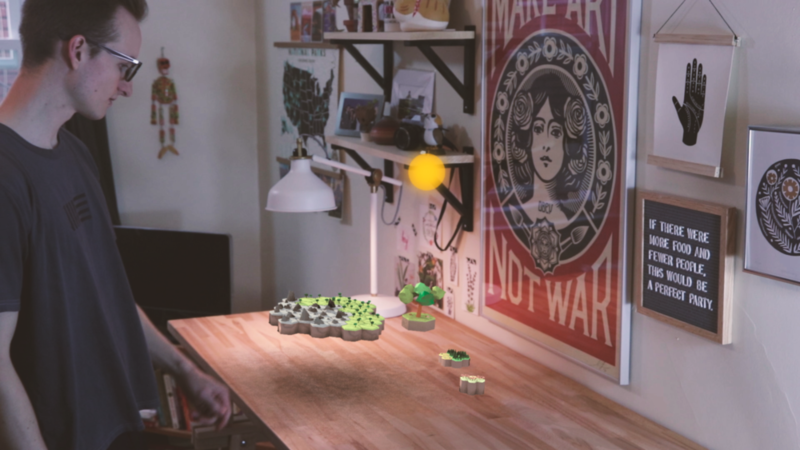 The in-home experience centers around an ever-evolving AR landscape, customized to represent a user's financial state and progress towards long-term goals. The in-world experience supports this progress, providing personalized suggestions and opportunities for improvement based on a user's behavior. Represented in a form of landscape, the in-home visualization provides users with a sense of their financial state and their progress towards financial goals in an unobtrusive manner. The system incorporates a series of weather patterns to indicate system status. When a user chooses to set up a new financial goal, Terra generates a virtual landmass sized according to the total amount of the goal. The landmass is also subdivided to represent the number of monthly payments needed according to the user’s current financial situation. The user can then choose a landscape type that best represents his/her mental model of the financial goal. A user can adjust the preferred scope for the visualization at any time, choosing to view his/her total financial state, an individual financial goal, or the progress for a single month. Terra is linked to a user’s financial account. It progressively populates the landmass with plants as the user makes financial progress towards his/her goals. Terra extends beyond the home environment, providing a user with actionable insights tailored to his/her individual habits. Learning from the user’s purchase history, Terra presents the user with opportunities to make changes to his/her financial behaviors, starting with small and easy adjustments and gradually increasing in difficulty. 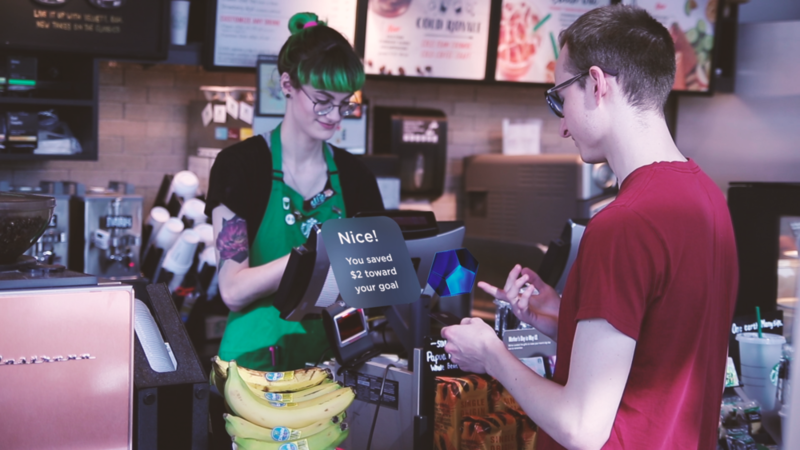 The in-the-moment visual cues support a user to improve financial behaviors. Facets of the orbs appear over time as progress towards goals is made, until the goal is met and the orb is complete. Once a goal is complete, a user is rewarded with an animal that he/she can add to the landscape, serving as a visual reminder of behavioral achievements.